This topic contains 27 replies, has 24 voices, and was last updated by Pally666 5 years, 7 months ago. I’ve written about the 2 Day Diet before (see below) and I promised to write a review; somewhat belatedly, here it is. I think Michelle and Tony Howell have done a great job. There are lots of books out there based on some variation of intermittent fasting, but this is one of the few that is actually written by two people who genuinely know what they are talking about. The book is based on research they have been carrying out for many years at the Genesis Breast Cancer Prevention project based in Manchester. As the name implies the emphasis is on intermittent energy restriction for 2 days, while encouraging people to eat a healthy Mediterranean diet for the other 5 days. They suggest that the two days should be back to back, for a variety of reasons. Firstly they think that if people do them back to back they are more likely to actually do them. Secondly “it may have additional health benefits”. The reasoning is that if you do your fast days back to back you are spending more time in a better metabolic state. As they point out, “levels of insulin and leptin fall quickly (within 24 hours) when we eat less, so cells can put more effort into staying in top condition”. I suspect that many people find it easier to split the fast days; that is certainly what most people who contact me say. I would be very interested to see a trial comparing back to back with split days eg Mondays and Thursdays. I have had a lot of contact from people whose blood glucose and cholesterol levels have improved markedly using the split day method. Dr Harvie is a leading research dietician and Tony Howell is professor of medical oncology at the University of Manchester; he is also research director of Genesis Breast Cancer Prevention based in Manchester. Their primary motivation is finding ways to reduce the risk of breast cancer and I have written about their research in The Fast Diet. Their most recent study was a randomised trial at the beginning of last year, the results of which have been sent off for publication to a nutrition journal. In it they did a three way randomisation of 115 women comparing a daily energy restricted Mediterranean style diet (ie a standard diet) to two different versions of the 5:2 diet. The first version of the 5:2 diet involved eating 650 calories a day for two days; on those days the women had to cut out pasta, bread, potatoes and all fatty foods. The diet consists mainly of milk and vegetables. For the other five days a week they could eat as much as they liked, although encouraged to eat healthy foods. Women on the second version of the 5:2 diet were banned from eating carbohydrates for two days of the week but they did not have a specific calorie limit. A sort-of modified Atkins approach. The third group followed a standard weight-loss diet, sticking to about 1,500 calories a day and avoiding high-fat foods and alcohol. The striking finding was that after three months the women on either of the 5:2 diets had lost an average of nine pounds (four kilos) – nearly twice as much as those on the standard diet, who lost just five pounds (2.4 kilos). They were also almost twice as likely to have stuck to their diet. As I mentioned above, they have a book out called The 2 Day Diet which I look forward to reading. It provides considerable further support to research showing that intermittent fasting offers benefits over and above standard dietary advice. I will write a review when they send me a copy. I will also keep you up to date with further developments. Exciting times….. The first two were ad lib Mediterranean diet on the other 5 days. Hi seredshaw, the Fast Diet recipe book comes out in a couple of months and has plenty (masses) of ideas for great Fast Day meals. It’s designed so you can mix and match, and eat the same thing as your partner, with suggestions to increase calorie counts where appropriate. Think you’ll love it – sorry for the wait, it was very important to us that it is all tried, tested, nutritionally sound and as comprehensive an answer as we can give to the question of what to eat on a Fast Day. You can preorder it by clicking on the Recipe book cover on the home page. I have followed a resticted calorie diet for several years (about 1300 cals per day usually). I am 68, female, height 5’5″ and weigh 11 stones. I have started on the 5:2 fast and find it reltively easy so far. My question is – should I eat a few more calories on non-fast days than I usually do? On the principle that the recommendation is to eat a quarter of 2000 on fasting days then it should follow that I should up my intake by 700 calories on non-fast days – this just seems too much to me. What do others think? You mention that there is a special focus by these researchers on reducing breast cancer, but I don’t see what happens to that theme. Is there a reduction of IGF-1? Or something else specifically directed to preventing cancer? Also, the diet seems to be directed to women — is it equally beneficial to men. Not just in terms of weight loss, but in other terms as well? Can you be more specific? hi just registered, do the two 500 cal fast days have to be seperate days or can they be one after the other? also can I use my 500 cals to eat anything? Im about 1.1/2 stone over weight been tring 1200 cals per day but struggerling now. Can someone just clarif please. Has anyone got an exit strategy yet? I am doing well and losing weght, finding it quite easy. 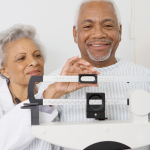 However,what is the maintenance plan to keep healthy and not put weight on? If I continue on fasting 2 days a week I will lose too much – is it probabaly best to go to one day a week or eat more on the fast days? @mrsbaldwinsmith – Regarding the two days, I think the choice is yours. I do two separate days (Mon & Thurs) and it is working fine. @bartywilts – Re exit strategy, in the book it is suggested that you just fast on 1 day to keep yourself ticking over, which is probably what I will do once I achieve my goal weight. My wife and I have been following the fast diet since watching Michael’s Horizon programme last year with great success. I love this post; how could I have missed it? I have Dr. Harvie’s book on pre-order from Amazon. Here in the States it comes out in June. I also have her cookbook on preorder. Still waiting for the FastDiet cookbook for preorder in the States. Love this way of eating, and I’m devouring everything I can read about it! Have you been attempting to shed weight from the belly, ill on the spare tire about your stomach? Are you presently locating you are continuously inquiring you this issue, ” how to shed significant belly, how am i able to do it”?You are not alone, you will discover 1000s of people wishing to shed weight and wishing to know how to shed a big belly. 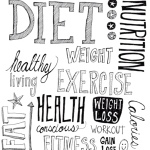 It could possibly be difficult are not able to it, trying all the fad diets only to find when you cease using their product the weight just rushes again that has a vengeance.Exercise: Regardless of whether you like it or not, you will have to do some kind of Cardio training. You could possibly commence off that has a brisk stroll each and every working day, half-hour is nice.three. Try to avoid processed meals: Preserve absent from all of that processed meals, like salami, man-made meats like, luncheon meat, pressed rooster etcetera. These food items have tons of unsafe chemical substances in them. Other nasty’s: Sugars, sweeteners, salt, synthetic hues and the like and the like.five. Drive: As I used to be crafting this, I used to be hearing Oprah, and there was a nutritionist talking and he reported, “95% of individuals are unsuccessful with getting rid of weight as a result of MOTIVATION”. Exactly what does that convey to us. It tells us that to do well with getting rid of weight you might have to have determined, get some excellent aid about you to definitely maintain motivating you.six. Foodstuff that enable you to shed excess fat: Right here are a few terrific food items to help you begin around the keep track of to understand how to shed significant belly, and get it done speedy if you are seriously interested in shedding that excess weight.Quinoa: It is a grain that is definitely reported to help reduce weight by getting a starvation busting protein in it with tons of fiber assisting you are feeling fuller for for a longer period. Environmentally friendly Tea: That is mentioned to really enable burn off stomach excess fat, it really works by stimulating the metabolism hence burning more excess fat. Grapefruit: While it doesn’t have any magical excess fat burning properties, what it does do is make you come to feel comprehensive with considerably less energy. And that is excellent in your case. Additionally, it is made up of excellent soluble fiber which allows do away with harmful toxins also. Hi everyone, all my life I’ve eaten when it was time to, hense I’m now Obese there I’ve said it. This is my 3rd week & I can’t believe how easy I’m finding it, have now settled on Mon+Thurs for fasting days, I go for a walk at breakfast time, skip lunch, have same family evening meal but full of veg or salads. I’ve no Side effects at all, this diet is Amazing Many thanks Mimi+Michael PS wk1 lost 2lb wk2 lost3lb. Hi, I am a big fan of the fast diet as is my husband. I have lost about 12lbs and he about 16lbs. His blood chemistry profile has greatly improved since starting the 5:2 program and he has now lost enough weight – 6ft, 164lbs. Michael, you went on a 6:1 maintenance program – how did this effect your blood chemistry results? Just want to clarify: I had lunch yesterday and nothing since. Will have lunch today to break my fast. Does my lunch today need to be a FastDiet lunch or may I have anything I choose to eat? Also, since I began fasting yesterday at lunch, am I to have ONLY 500 calories today and not break my fast until breakfast tomorrow morning? I’m confused about the 24 hour fast vs the reality of 36 hour fast. Please clarify and thanks so much! I have read your book twice and am on the third time and have bought for a friend and recommended another friend purchase. I LOVE this approach! I can and will stick with this forever. I find two days back-to-back easier to do. In fact, it’s hard for me to stop it slipping into three days! 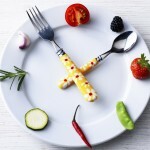 I don’t have a history of calorie restriction or eating disorders – apart from eating too much! – but after my first fast day (36 hrs), I wake up feeling not the least bit hungry and this tends to continue all day. I’ve been doing this for 2 weeks and have lost 8lbs. I know it won’t be an ideal pattern to follow long term, so I will look again at the end of the month. I’ve just come out of an almost 3-day back-to-back water fast and it wasn’t half as hard as I imagined. I think it was around 68 hours. Of course, I felt hungry, but it was not an unbearable hunger, the kind where you feel ravenous and it feels like your stomach is going to eat itself XD It was a very bearable, even comfortable kind of hunger. When you have already had some experience with fasting, the hunger never gets too terrible. It is a very subdued hunger. I think it’s my longest fast ever and I even planned to keep it up until tomorrow or even Friday, but my mum cooked a very healthy, delicious dinner and I just wanted to share it with her =) I’m fasting again on Friday, though. 10 days into the diet with four days of fasting using the same pattern of meals as Michael I have lost some weight, learned to differentiate between hunger and the munchies and tried out some great recipes. I think the forums are great but there are a lot of repeat questions about the best way to go about it. I wonder whether this is because the book, engagingly written and informative as it is, seems to present two different viewpoints. From my reading, Mimi’s goals are mostly weight-loss related and focus on what you can eat via delicious recipes. She suggests you can spread your limited calories out over the day and adapt the timings to fit your own needs and lifestyle. Michael seems to be promoting the health benefits more, which apparently come from controlling the intervals between the limited calorie meals. Both may be compromises from the original trials of 3-day fasting or ADF which many people would find hard to manage and as yet there’s no clear indication that the compromises bring the same benefits. I wonder whether it really matters, because losing weight itself (if you need to)should bring great health benefits? Also, if by fasting because you need to improve other health factors and as a bonus achieve some weight loss too, that is also good. It really does seem to be up to the individual to find a way that suits them,depending on why they are doing it and this can be hard work. The forums are really helpful in this and merit the time spent in reading through for information that chimes with one’s own situation and encourages people to experiment and stick at it. I have a bookshelf full of HOW TO books on diets, how to run a marathon, how to cure a bad back and how to paint a watercolour amongst other topics. They all promise a lot and yet always disappoint. This book needs a bit of work to appreciate as it doesn’t specify rules but I love it. Now, it’s a feed day for me, not fasting or feasting and I feel better than I have for weeks, so thanks everyone for the inspiration. 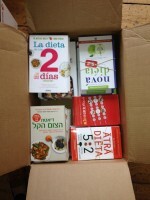 I am very pleased to hear about the 2 Day Diet which I just read about on amazon.com. I have ordered the book, and I am going to try it. I am convinced that 2 day fasting is the way to go, as I’ve had success with The Fast Diet before, but I have health issues and also want to learn to eat healthy. It is my understanding, from what I read, that the other 5 days of The 2 Day Diet focus on a mediterannean type plan, and I am interested in this way of eating. There is no calorie counting involved, just learning about appropriate portion sizes, which I need to do anyway. Dr. Mosley, how generous of you to give acknowledgement to The 2 Day Diet and give so much information about it. Thank you. My wife and I began the 5:2 ADF diet on 15 April. With a starting mass of just over 23 stone, I stand at 1.9 metres. In the past eleven weeks, my weight has reduced to just under 22 stone; averaging roughly 700 grams per week. While I am thrilled about this loss, I would like to lose a wee bit quicker. That being said, I have currently incorporated a third fasting day into my regimen, making my fast days Monday, Thursday and Saturday. I did this last week with relative ease but will take it on a week by week basis. Does anyone have any thoughts or experience with regards to this endeavour? Remember it’s a marathon and not a sprint. Well done! Thank you annette52. You are right, it is a marathon. I’m just excited at the prospect of getting this much needed weight gone. The way things are going, I’ll reach my goal weight of 15 stone 4 in approximately nine more months. That will have been one year, which is quite acceptable. Having tried different diets, as I’m sure many here have, I know that my body will plateau right around my current weight. What I am doing by fasting three days is trying to keep my body from falling into a rut. For now, I’ll do a 4:3 diet for two weeks to a month, then switch back to 5:2. I may do this on and off for a while. We’ll see how it goes. Hi bobby98682,I was wondering how you were getting on. It doesn’t matter how long it takes as long as you can keep the downward trajectory going. It may be that some weeks the weight doesn’t seem to shift on the scales, but the inches do instead, so don’t just think in terms of weekly pounds lost.Keep a record of your measurements and see how clothes fit too. I don’t think that weight plateaus at the right weight, it is just settling with the changes, plus, of course we need less calories to maintain weight as we get smaller.I recommend that you change the type of exercise that you take regularly to keep things moving. I am sure that going swimming a couple of times last week was the prod that my body needed to start losing again. If you want to increase the weight loss, then you will need to build more muscle which you could do by using a pedometer and walking 10,000 steps a day, go swimming a couple of times a week and increase the number of lengths that you can do each week. How about cycling? As your thighs trim down, everything becomes easier to do. I’ve lost 2 inches off each thigh which has meant that I can now walk faster and for longer. I wish that I had taken measurements when I first began but I did take some photos. Tomorrow is my official 3 month mark and I will take measurements then. As for exercise, I am able to get to the gym on a regular basis, Monday through Friday and feel great. I have an old knee injury that prevents me from walking great distances but find the elliptical to be quite accommodating. I just increased my time and now, according to the machine, travel 6.4km in 40 minutes. The machine records calories expended and am up to 600+ kcal per session. I have also, at the beginning of July, added strength training to my repertoire. All in all, I’m feeling quite good about my progress and as of last weigh in day, I am down 1 stone 4. I just thought that adding a third day of fasting might keep my body from getting complacent with this new found routine. I have found, as did Dr. Mosley, that maintaining a 4:3 schedule is not easily maintained. This upcoming week, 5:2 it shall be. I may throw in a third fast day here and there, just to keep things interesting but it will be the exception and not the rule. When I began, I was just over 23 stone. At 1.9m tall, I hid it quite well but as age progressed, health problems were inevitable. I feel this diet has given me a new lease on life. I don’t like to push it, but I have been blogging about my 5:2 diet. If you are so inclined, feel free to click my name. It will bring you to my profile. It is there that I have posted a link. Have a read and tell me what you think. I’m 42, italian from Milan. I began the 5:2 ADF diet on 14th February after watching Michael’s Horizon programme (from watching it I understood the two days had to be back-to-back but even now I find it easier to continue this way) with good results. I didn’t loose much weight because the possibility of overcompensating is one of the reason I like this diet and because I was slender enough already (at the price of always controlling me, a thing no more necessary). My yearly medical check-ups can confirm instead astonishing results in terms of blood tests (they were good enough, now are excellent, the best ones in the last 12 years) and blood pressure (it was borderline now is fine). To be up to date I read Michael’s book a couple of months ago and I’ve just read Howell’s “The 2 Day Diet” book. I don’t think Howell’s method can work because unlike Michael’s (600 Kcal on 2 days, do what you want the rest of the week) it’s all but simple. Their method is full of lists of permitted foods and calculations to define the correct portions in order to achieve a correct “normal” mediterranean diet so that even what they call “free days” are all but free (they would be more honest calling them “our mediterranean diet version days”: I’m italian, and I couldn’t easily follow it). I apologise for my imperfect english and I hope I’ve been of some help. I am a 43 year old woman and I am doing the 5:2 diet some weeks but also the 4:3 diet on other weeks I fast all day and then have my 500 calories in the evening, I try to have fish and vegetables but have stayed at about 450/460 calories. I have no problem fasting all day but do find that if I do 2 days in a row I am struggling by the latter part of the second day, more from boredom than hunger,I don’t drink hot drinks never have and find water a bit boring after that much time. I have not lost much weight at the moment but that is because I like to eat on the feast days and I am probably eating to much but I have bought a diary and I am now going to track what I eat on my feast days as well as my fast days. I have a concern which is how easy it is to fast and worry that I could go for longer than is good for me. I have always been able to go for hours without food and have only eaten for emotional reasons and boredom for most of my life so do not actually know when I am hungry. Maybe this will kick start my body and brain.